Andy Hill was a basketball scholarship player for UCLA’s NCAA Championship title teams under Coach John Wooden in 1970, 71 and 72. 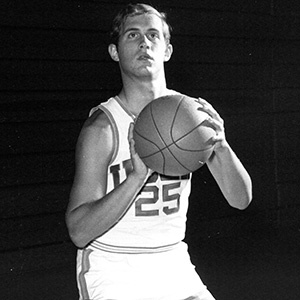 During his senior year at University High School in 1968, Hill was second overall in scoring in the LA City by averaging 27.2 points per game and was the Western League Most Valuable Player. He was an All-City selection for the second straight year. At UCLA in 1969 he was co-freshman MVP with Henry Bibby when he led the Bruins in scoring at 26.8 ppg. He was selected for the 1969 USA Maccabiah team. After playing professionally overseas in Israel for Maccabi Ramat Gan, Hill coached at Santa Monica College before starting a successful career in the entertainment field. He was a movie and television executive with Columbia Pictures Television. From 1991-96, Hill was the president of CBS Productions, leading the development and production of programming owned by the network. He reconnected with Coach Wooden after 25 years and they co-wrote a best-selling book, Be Quick—But Don't Hurry! Finding Success in the Teachings of a Lifetime, based on the application of Wooden's coaching principles to the business world. It is now in its 17th printing.